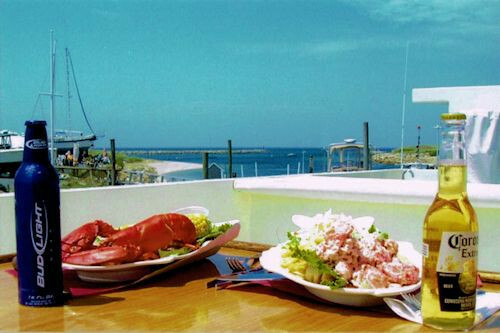 If you and yours are having trouble deciding upon the perfect place for a rehearsal dinner, small reception, or even a bachelor or bachelorette party, then consider Lobster Roll Cruises out of East Dennis. Cruises are offered in different packages, but all run out of Sesuit Harbor for great sightseeing on Cape Cod Bay. There is seating for up to 60 people, so this is a trip that is best reserved for rehearsal dinners (where not as many people will be in attendance [same for bachelor/bachelorette parties]) or for small wedding receptions. Not only is there a wonderful menu offered, but a full bar is available for reservation (cocktail cruises are one of the packages offered). Cruises run from spring through the fall and are not offered during the winter (who wants to sit on the deck of a boat during a cold winter day? BRRR!) and can be booked for the time that is best for you. So if cruising along Cape Cod Bay, sipping a cocktail, and enjoying tasty seafood is your cup-of-tea, then look into reserving a private charter with Lobster Roll Cruises for a memorable and delightful time.